BBC NEWS | UK | Magazine | Why can't we stop drugs getting into prisons? Why can't we stop drugs getting into prisons? Prisons are among the most secure places in the country, yet they are awash with illegal drugs. How do these get in? You don't have to be a genius to get drugs into Forest Bank prison. You just need a long throw. "That's mainly where the drugs parcels get thrown over the wall," says Steve. He should know, he has been a frequent visitor to the jail, mainly for drugs offences. "You'd have somebody on the wing looking at the Astroturf," he says, explaining how a "drop" is co-ordinated. "When someone gets on the Astroturf they ring [the person doing the drop] on their mobile phone¿ and say right throw it over now." Forest Bank, in Manchester, has a major drugs problem. 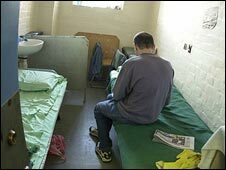 According to official statistics, 10% of the total prison drug finds in England and Wales come from this one jail. The jail has recently put up a net to stop packages being thrown over but, Steve says, there are plenty of other ways to smuggle drugs inside. Mobile phones - themselves banned - are an integral part of this trade. Steve recalls from his time inside going on an errand for an inmate who was also a dealer. It meant meeting a woman in the visitors' room, who Steve had never seen before. "Just before the visit [the dealer] has gone 'this is who you're seeing and I'll just take a picture of you and send it to her so she knows who she is seeing'." It's stories like Steve's that fuel the perception that our prisons are awash with drugs. But given the tight security measures, why can't we stop drugs getting into prisons in the first places? Part of the problem is the Prison Service doesn't know exactly how big the drugs market is, says Huseyin Djemil, a former head of drug treatment policy for the National Offender Management Service, which oversees prisons and the probation service. Mr Djemil has made his own calculation of the market. He estimates there are 40,000 problem users in prison at any one time - that's about one in two of all inmates in England and Wales. On that estimate, he draws up a worst-case scenario. "You're looking at 20 kilos [of drugs, mostly heroin] a week to supply the national market" says Mr Djemil. Annually that works out to over a thousand kilos of heroin, which would mean around a £100m pounds worth of drugs are being traded behind prison walls. Bringing in such huge quantities makes it potentially lucrative for the smuggler. If the prison service wants to get a better handle on the drugs trade, Lord Ramsbotham, the former chief inspector of prisons, says it has to tackle the most controversial supply route - staff involvement. "Without the staff these things couldn't get in... I'm not saying the staff are the people who bring most of it in, but I suspect there are people who don't notice deliberately, including for money." We spoke to people across the prisons establishment who share his concern. One former governor says although the popular perception is that most drugs are coming in through visits there was "more going in by staff than any other way". Prison service employees are prevented from talking to the media but several warders were willing to break the rules. One officer at a jail in southern England says he assumed most of the drugs were coming in through a handful of corrupt staff. "Some of it they do it for the money so they deliberately make it known that they will do 'jobs'. Others they're young, easily manipulated if you like, and it starts with something simple, 'could you get me a watch battery'... and it just spirals from there." In 2006 HM Prison Service and the police tried to estimate the number of corrupt prison staff. A report leaked to the BBC estimated there were at least 1,000 corrupt officers, some of whom were involved in smuggling drugs and phones into jails. Conservative MP Henry Bellingham, who's part of the shadow justice team, has his own alarming estimate for the amount of drugs being brought in by staff. "I'd argue that 80% is coming in on members of staff," he says. There are "quite a few prisons where it's impossible to get it in over the wall and I don't accept great numbers are on visitors, so you're left with staff". Now and again, though, warders are caught. Last week Adam Seamark, a prison officer at Woodhill top security prison was jailed for five years for smuggling heroin, crack cocaine and cannabis into the jail on five separate occasions. The police officer in charge of the case, Det Sgt Ian Jarvis, says each package probably contained around £1,000 worth of drugs "could be worth anywhere up to £8,000 or £9,000 in prison." Earlier this year the government appointed a former senior police officer, David Blakey, to conduct an inquiry into disrupting the supply of drugs into prison. He is due to report at the end of May. Mr Djemil says unless the service tackles staff involvement in the drugs trade, it won't make major inroads into the prison drugs market. "I think it's shying away from that final step, a bit like the [Metropolitan Police] did. The Met wanted to confront corruption and they had to go to extraordinary lengths to do it and I think the prison service at that cross roads." HM Prison Service is spending £70m a year treating drug addicts and prisons minister David Hanson says the government is committed to rooting out corrupt officers and has introduced new tough penalties. "The vast majority of staff in my view are also committed to that task because they recognise their professional integrity is challenged by that failure of that small number of staff." Have better detoxs for prisoners and stop shutting the problem away. Stop sending so many people to jail - deal with them properly. I have been in and out of jail since I was 16, I'm now 23. Listen to us prisoners and solve problem. I have been proud to be a prison officer for 30 years and would point the finger at the current recruitment policy adopted by the service. Its not the job for an 18-year-old nor a 60-year-old for that matter. I have worked in the Prison Service for 29 years, the conduit for most drugs getting into prisons are through prisoners on visits or over the wall as the ex-prisoner says. The MP Harry Bellingham is talking out the top of his hat - yes like all organisations, we will have bent staff. I would envisage there to be around two to three bent staff in most establishments and if any member of staff has suspicions they are grassed up immediately. The drug problem in prisons reflects the worst side of society, no different from the slum areas of towns and cities throughout the country because that is where the majority of our clients come from. I work in a prison and the place is full of drugs. HMP Kirkham is a category D prison and drugs can be walked into the prison by prisoners going on working out schemes home leaves and town visits. It's unbelievable. I am a drug counsellor in a prison. Just recently a fellow colleague of mine (also a drug worker) has been suspended for bringing in drugs and mobile phones. Security is a joke. A drug worker brings drugs in. She isn't even being prosecuted, yet they have all the evidence - just "investigated". OK - you've got your drugs in. But how do you pay your external supplier? And what do you do with the money you earn inside? Where do you keep it, and how do you get it out? And what do you spend it on inside? This wouldn't be happening if there wasn't significant rewards for the dealers, free and incarcerated, so how does it all work? There must be collusion on a grand scale. Why not search all prison officers at the start and end of their shifts every day? It seems that mobile phones play a major role in getting drugs into prisons. Yes, they are banned in prison, but it would be relatively easy to make them unusable in prisons by installing a "picocell" - a unit that mimics a mobile phone base station but which does not route calls. 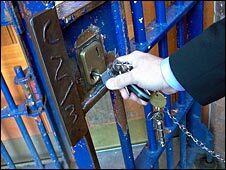 Anyone attempting to use a mobile phone in a prison would find their phone would register with the picocell and thus could not make calls. It would seem that if the going rate for a member of staff who is caught smuggling Drugs is a mere five years (less probation ) some will see it as worth the risks. The penalties will have to be greatly increased to ensure that staff will be too afraid of the consequences to commit the offence. Now I can understand how drugs get into prison, but how is it all paid for? Do the inmates have enough cash to pay for the drugs? Mobile phones should be banned or jammed totally, visitor and staff screening should be a daily routine, any prisoner caught in possession should suffer an automatic increase in sentence and all privileges withdrawn for 6 months, staff in possession should be sacked and heavily fined, visitors in possession should be banned. Our attitude to prison and prisoners is far too liberal. When they introduced random drug tests into prisons a few years ago everyone switched from dope to smack overnight. Thank the Government for that clever move. "... and it starts with something simple like, 'could you get me a watch battery'..." Why does a prisoner need a watch battery? There's the root of the problem, too many home comforts. Because they suspend drug-sniffing dogs for killing prison ducks (Drug dog suspended over duck death).